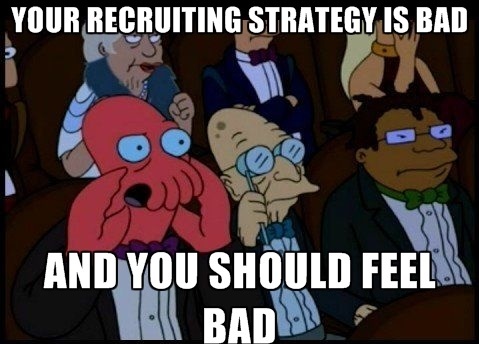 Recruiters really baffle me. I’ve gotten some silly reach-outs before, but this one takes the cake and I felt compelled to share it. First off, let me link you to my linked-in. I’ll be here when you get back. Now then, I hope you have at least some sense of what my background is? I mean, you probably didn’t dive too deep, but you skimmed it at least yeah? I’ve got an opportunity with a SICKKKKK (unprofessional, I know, but really, it’s that exciting) company in Culver City that’s looking for a Network Gameplay Engineer to join their team ASAP. They’re creating the software that HTC, Sony, and Oculus Rift hardware will be capable of using as well as some hardware to compete with it. Full integration of the varied VR platforms. Cool. Stuff. Man. Debut coming at the end of the year with all their hard work. THIS IS THE FUTURE. If virtual reality is your thing -AND HOW COULD IT NOT BE- let me know a good time to contact you and I look forward to hearing from you! ( or if I can’t convince you, got any friends?? Now, first off, I have zero issue with the tone or levity. It’s a refreshing change of pace from a two para run-on sentence of industry buzzwords and corporate speak. (Though it does seem a bit over the top and forced after a bit.. maybe dial it back some?) However, I have to ask… WHAT ON EARTH ABOUT MY PROFILE SAYS NETWORK ENGINEER TO YOU? If you have 50% less recruiters, spend 50% more time focusing on key leads, stop scatter shot approaches, and maybe, I don’t know.. give it a honest personal touch… maybe, just maybe, you’ll find the ideal candidate faster than you imagined.. and maybe if you do that enough, you’ll build a team you never thought possible. People are talent.. not cogs.